Outdoor Education 1 Edition Outdoor Education: Methods and Strategies will show students how to -use physical, cognitive, and affective methods to teach lessons in different settings to different audiences; -link educational theories to teaching methods and choose the best method for each setting; and -implement strategies with easy-to-use forms and lesson plans.Outdoor Education: Methods and Strategies provides all the necessary information and tools for teaching outdoor education. It applies educational theories to outdoor teaching methods and helps educators choose the instructional strategy that will work best for their audience, whether they're in a school, nature center, adventure center, camp, environmental learning center, government agency, or university. 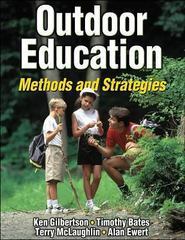 This text includes the following features:-Easy-to-use forms for designing, implementing, and evaluating outdoor lesson plans-Six highly detailed sample lesson plans, representing a variety of settings for different age groups and abilities and using physical, cognitive, and affective methods-Teaching tips, real-life case studies, and interactive exercises to apply concepts in each chapterOutdoor Education: Methods and Strategies contains practical lesson plans and examples that go beyond the normal scope of a text. It includes key concepts, objectives, and summaries for each chapter, and it presents an extensive set of educational methods and applications to foster optimal learning.Part I defines what outdoor education is and details the professional expectations of an outdoor educator. It also explores educational theories that support outdoor education, including developmental stages, learning stages, and constructivism. Part II covers teacher preparation, including understanding the backgrounds and abilities of participants, creating a successful learning environment, teaching effectively in a variety of outdoor settings, and designing lesson plans.In part III, the authors explore methods and delivery of outdoor education. They examine the uses of physical, cognitive, and affective methods for teaching, and they provide six ready-to-use sample lessons. They also help readers reflect on, evaluate, and improve their lesson plans through experimentation.Outdoor Education: Methods and Strategies will benefit all educators, new or veteran, in enhancing their audience's awareness, appreciation, and knowledge of the outdoors. Ultimately, it will advance educators' abilities to increase people's enjoyment and understanding of the environment.